JAMS V7 transforms the way companies manage IT processes. 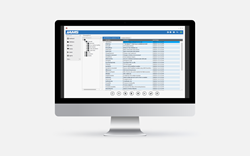 MVP Systems Software, Inc., a leading provider of enterprise job scheduling and workload automation software, announced today the release of JAMS V7, a major new version of the company’s flagship solution. JAMS V7 builds upon the company’s deep expertise in batch processing and accommodates growing requirements for jobs running on public, private and hybrid cloud architecture. The latest version of JAMS offers enterprises a multitude of new features for automating complex collections of IT processes, and it enables them to distribute automation tools to a wide range of users.